Shop for unique Australian Shepherd Gifts. 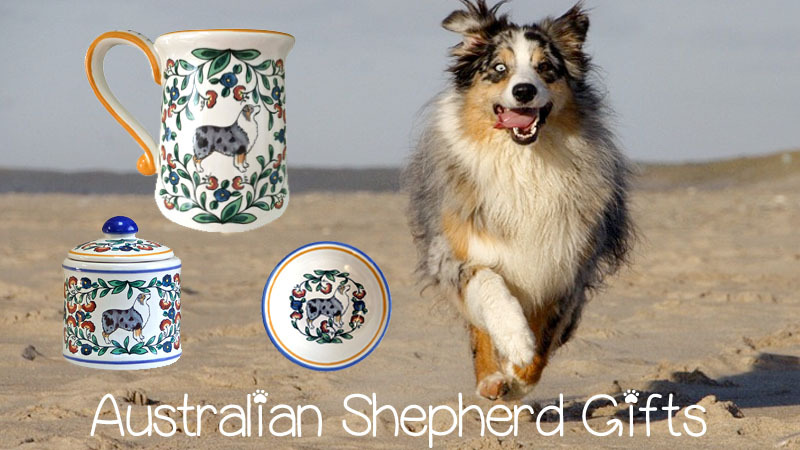 At Shepherds Grove, you will find beautifully made Australian Shepherd merchandise such as Australian Shepherd mugs, wine stoppers, sugar bowls, creamers, dipping bowls and other items. There are several Australian Shepherd coat varieties to choose from including: Blue Merle Australian Shepherd (in a light and a dark version), Red Australian Shepherd, Red Merle Australian Shepherd, and Tricolor Australian Shepherd. You also have the option to customize the artwork to reflect your Australian Shepherd's specific markings (a small art fee applies to custom work). All of our Australian Shepherd gifts are made in America. More specifically, they are handmade in small batches in our Eureka, California, studio. Our stoneware is very durable – so you can enjoy your Australian Shepherd pottery on a daily basis without worry (they are dishwasher, microwave, and oven safe). We stock very little, if any, inventory of finished Australian Shepherd merchandise but, rather, make your items when you order them – so really, each piece is made for you. Orders can take 2-3 weeks to be shipped. Australian Shepherds are known for their mental acuity, their herding ability, and lets not forget, their beauty. Their name may refer to the Land Down Under, but Aussie dogs are as American as S'mores. So if you're looking for something unique to celebrate your Australian Shepherd, you've come to the right place.